Peter Damm has been described as "legendary" - he is known for both his exceptional abilities as a player, and for his editions of many of the standard works in the horn repertoire. In particular, among his performances, his recordings of Strauss with the Staatskapelle Dresden are held in high regard. Damm was born in 1937 in Meiningen, Thüringen, Germany, which was in the GDR (East Germany) from the end of World War II until reunification in 1990. He began his musical education at age 11 with violin lessons, moving to horn at age 14, studying with Franz Nauber in Meiningen. After a short period as a forestry apprentice, he studied horn with Karl Biehlig at the Hochschule für Musik in Weimar (1951-1957). 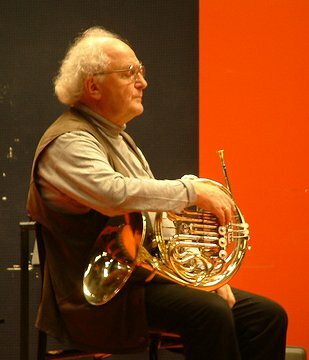 Damm began his orchestral career in 1957 as solo hornist with the orchestra of Gera, Thuringia (Orchester der Bühnen der Stadt Gera). He became principal horn in the Gewandhaus Orchestra of Leipzig in 1959 and principal horn with the Dresden State Orchestra (Staatskapelle) in 1969. On his retiring from Dresden in 2002, the orchestra made him an honorary member. He balanced a solo career with the orchestral job, which he enjoyed because, "I'm the type of person who feels his best when he is under pressure. … I never wanted to leave the orchestra. For me, the orchestra is a very good critic; when we rehearse, we make comments to each other, and it is only in this manner that an orchestra or a group can maintain a high standard of quality. … The experience between both disciplines brings something extra to each one. I know when I have to play as a soloist and when I have to move back and blend in with the orchestra." Competitions include the International Competition Moscow 1957 (Silver Medal), International Music Competition of the ARD München 1960 (Second Prize), and the International Competition Prague Spring 1962 (First Prize). Other honors include the titles Kammermusiker (1969) and Kammervirtuose (1971), Art Award of the GDR (1972), National Award of the GDR (1979), Fritz-Busch-Award (1995), and Art Award of the City of Dresden (1998). Damm has appeared in solo performances in Europe, Japan, South America, and the United States. He has played the Strauss Concerto op. 11 in over 150 performances. His editions of the standard literature are published by Breitkopf and Härtel, and he has recorded some thirty solo works on the Eterna label. His recordings of the Mozart concertos with Neville Marriner are the result of decades of research. His extensive repertoire of solo works, chamber music, and concertos ranges from 18th century works to contemporary music. In an interview in the November 1994 issue of The Horn Call, Damm describes the difficulties of traveling from the GDR (East Germany). "If you played in one of the big orchestras, then you had a bit more freedom. All the concerts that I did in the West were through the initiative of outside invitations, and I wasn't always allowed to leave the country! I discovered much later that there were two years where the agency simply told everyone that I wasn't available. However, after I came to Dresden, as long as I could arrange with the other horn players to have the time off, then I could accept most offers, and was allowed to travel." "Another problem was that we had to give up part of what we had earned – a so-called 'mandatory transfer' into East German currency – and there wasn't much money left over. Sometimes I would rather eat in supermarkets than in restaurants, and buy music instead. Finally I went to the Ministry of Culture in Berlin to explain that it was necessary to buy music to get new repertoire, and they agreed to reduce by ten percent the amount that I had to transfer. … Now if I decide I want to do something, I can simply get in my car and go; I don't have to ask permission, and apply for permits and so on." Until 2007, Damm was honorary horn professor at the Carl Maria von Weber Conservatory in Dresden and is a frequent guest professor all over the world. "I enjoy working with young people, especially when they are interested in learning. … It is important not just to practice, but to practice intelligently. … I worked for many years at the International Music Seminar in Weimar where my goal was to bring the East and the West together. After the German reunification, I stopped working there because I felt I had achieved my goal." He has been president of the International Competition for Wind Instruments in Markneukirchen since 1986. He was elected an Honorary Member of the International Horn Society in 1992. After 56 years, Damm played his last solo performance at the 2007 International Horn Symposium in La-Chaux-de-Fonds, Switzerland. His motto: "Finish your career as long as people still regret it..."